This example demonstrates how you can stream video to multiple locations simultaneously in C#. 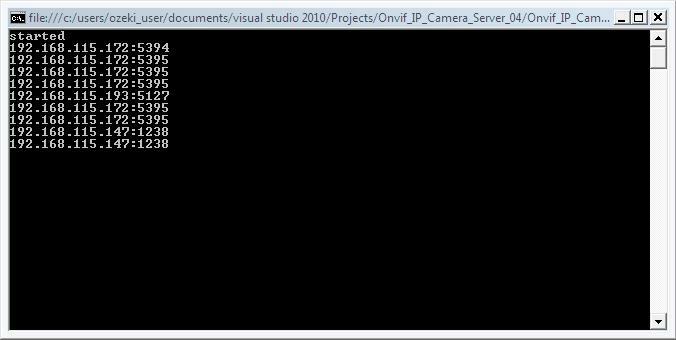 To implement this example, you need to have OZEKI Camera SDK installed, and a reference to OzekiSDK.dll should be added to your Visual Studio project. In the following you will be shown how to implement an IP camera live streaming service, which will involve multiple IP camera feeds to be presented to users across the web. There is a way that it could be installed on a local server on site. This way it can stream videos only after the authentication of the user. This solution is easy-to-use and deliver high quality, reliable video from a main location to secondary locations anywhere in the world. The video over IP solution allows users to stream live or file-based video decoders over any network connections. This option allows users to stream video from one main site to multiple recipient sites at the same time by using Server. The Server is a centralized secure distribution tool that manages large amounts of video for live playout or on-demand video scheduling. Videos can be played out for mobile phones and tablets, or live streamed to your computer. Video over IP products and applications are easy to use, and saves time. This technology allows us to send video reliably over public Internet connections at low data rates without using bandwith-consuming Forward Error Correction (FEC). An average camera lets one or two clients at the same time but this problem is easy to solve with OZEKI Camera SDK. You just have to connect it to the server and then numerous clients can connect at the same time. In this way we can stream videos to multiple locations simultaneously. This example is about a Console Application instead of a Windows Forms Application. You will not need the image of the camera in the application now so the console interface is just enough. start() method which will start your server. stop() method which will stop your server. server_ClientCountChange event which will write the list of clients to the console. Please note that none of the cancel and disconnect methods are included in the example because of the demonstrating intent and briefness of the article. You may need to replace the first attribute of _server.SetListenAddress to your own IP-address. Please set first attribue of _server.SetListenAddress to your own IP-address.